By Frank at Putting Out the Fire. I had heard rumors that the Japanese had a few whiskeys that rivaled anything out of Scotland for some time. This weekend I was able to try Yamazaki, a Japanese single malt, for the first time and I’m still trying to wrap my head around how good it was. 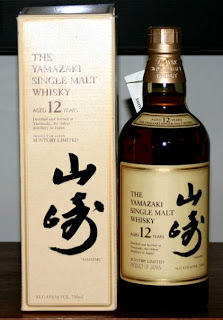 Yamazaki may just be my new favorite “Scotch” as I don’t recall enjoying a new whiskey as much I enjoyed Yamazaki. Over the past few years I’ve taken a liking to a peatier smoky flavor in my single malts. While Yamazaki doesn’t have this character as much as I’m used to, the smooth honey sweet palate made me question my fascination with Highland and Islay peat. After the first three sips I actually reached for bottle questioning the alcohol content. I didn’t remember drinking anything that smooth since my last tasting of Macallan 25 a few years back. If Yamazaki does have one drawback it is the mild finish. This may just a idiosyncrasy of mine alone as I’ve drank single malts with a smoky finish without a changing it up for a bit a variety for some time. Still, Yamazaki has a pleasant and ubër smooth finish and its difficult drink to set down. Yamazaki may just be the best thing imported from Japan since all those Gojira flicks which entertained me though the long years at the orphanarium. At one time I believed that the only good single malt whisky was of Scottish origin; I now know that is simply not the case. As many of you know, I moved from Kansas to Pennsylvania because of a job opportunity. One of the first things I had to adjust to was many of the beers I had grown accustom to and liked are not as available, and I had to adapt. The move also allowed me to try some beers that I had heard about but were not available in the Midwest. Yuengling (America's oldest Brewery) does not make it east of the Mississippi (or Appalachia, for that matter). Tröegs has been an extremely pleasant surprise. The beers of Brooklyn Brewery are wonderful, and the most amazing is that I can drink stuff from Stone Brewery here, while it is unavailable in Kansas. It's a California beer. Go figure. Penn Brewery has also grown on me. Yuengling is now my everyday beer, while Tröegs and Stone tend to make up my "change up" beers. Penn beers have also grown on me. If any of you manage to make it out this way, we'll go to Mad Max. They have a good selection, and happy hour is Friday afternoon. That's not to say I miss my old favorites. Leinenkugel can only be found in two or three incarnations (a shame) and isn't the bargain it is in Kansas. Avery (perhaps my favorite brewer) is unheard of, and Flying Monkey (my favorite Kansas brew, and my favorite brewery tour) probably doesn't make it East of the Mississippi. When I go back to visit my family, you can bet I'll be bringing home 5 or 6 cases of beer. I spent a number of years in Kansas, both as a minor and as an adult. At one time, Kansas bridged that gap and kept in touch with its prohibitionist roots by selling 18 – 20 year olds (and anyone else who wandered into the taverns, groceries, and convenience stores) 3.2% beer. Measured by weight, the alcohol content is actually 4% by volume. Many "real" beers produced here and elsewhere range from 4 – 5% by volume, so the differences are often minimal. However, probably for tax (and sin-tax) purposes, a few states still distinguish and restrict certain types of sales to "three-two" beers. Recently, I've discovered another "point two" — one that makes more of a difference. If you have some European imports sitting around the house, take a look at their labels. Where many beers destined for U. S. import traditionally followed our 12 ounce bottling system, a growing number of them have dropped the volume to 11.2 oz. That's .8 oz. less per bottle or 4.8 per six pack. However, I haven't noticed any importers who've dropped the price by a similar percentage. Now if the InBev purchase of Anheuser-Busch is completed, does this mean that Bud Light will be .8 ounces lighter in months to come? Orycteropus Afer is owner of Aardvark Alley. Mason Beecroft has posted an blog article detailing the blessing of a brewery. I agree that this needs to be added to our standard rites! Check it out. One of the things I have learned as I have grown up (and as my political sensibilities have matured) is how much one can love and hate capitalism. Capitalism allowed for the development of the craft brewing, brewpub, and microbrewing industry. It also allowed Granite City Food and Brewery to come into reality. I have always been a little wary of chain restaurants, but this takes the cake. For instance, if you come to my fair city and say you want to go out for Mexican food, I'm not going to take you to On the Border. I'm going to take you to Connie's, possibly the strangest name for a Mexican restaurant you have ever heard. Yet year after year, we vote it the best Mexican restaurants in town. Admittedly, you have to drive in the barrio to find it, and the building has been run into three times by various vehicles over the years, but the food is excellent and the atmosphere has an authentic feel to it. It's not the fake Mexican feel places like On the Border have. Wichita is full of interesting hole in the walls like Connie's, but the suburbs are dominated by chain restaurants. Sadly, much of the best food is found in decapitated buildings in less than desirable areas. Getting back on track, who decided that creating a chain brewpub was a great idea? I am sure this has been said many different times by many different blogs (both on the left and on the right), but this goes against everything the brewpub experience is all about. It's not about having restaurants serving the same beers nationwide. We already have that. It's about men (and a few women) pushing the envelope and experimenting with different ingredients and trying new ideas. 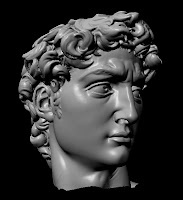 It's about pushing the envelope by reviving old styles and putting new twists to them. It's about being adventurous and seeing if your ideas are a success or a failure. It isn't about having 30 something different locations around the central US serving the same beer. We already have that. Everywhere. I went there once when my parents bought my wife and I dinner there. It reminded my of Glacier Brewhouse in Anchorage, except without the decent-priced beer. Maybe the beer would have been good, but at the price they were asking, there was no way I was drinking. The food was good, but overpriced. They were asking $9.99 for a half-gallon growler. I can get a gallon at the Glacier Brewhouse for $5.95. It wouldn't surprise me if Glacier has the better beer too. Sampling a different Minnesota beer each week for a year and sharing your tasting thoughts with others? Brilliant. Check out Brew52 and sign up today to join the fun. Although I'm a week behind, I'm thinking of joining. The only problem is that I don't want to buy a new 6 pack of beer each week. We really aren't big beer drinkers in the cold weather months. Plus with a house full of teens, I don't want to end up with a large stash of beer after a few weeks. I wonder if there is a store that sells beer bottles individually??? After 18 years, the son is now old enough for his first drink. Dad takes him to the bar, tearfully tells the son he is proud of him and orders up the biggest, strongest mug of beer for his boy. With all the bar patrons looking on curiously and the bartender shaking his head in disbelief, the boy takes his first sip of alcohol. Swoooosh! Plop!! A torso pops out! The bar is dead silent; then bursts into whoops of joy. The father, shocked, begs his son to drink again. The patrons chant "Take another drink!" The bartender continues to shake his head in dismay. Swoooosh! Plip! Plop!! Two arms pop out. The bar goes wild. The ! father, crying and wailing, begs his son to drink again. The patrons chant, "Take another drink! Take another drink!!" The bartender ignores the whole affair and goes back to polishing glasses, shaking his head, clearly unimpressed by the amazing scenes. By now the boy is getting tipsy, but with his new hands he reaches down, grabs his drink and guzzles the last of it. Plop! Plip!! Two legs pop out. The bar is in chaos. The father falls to his knees and tearfully thanks God. The boy stands up on his new legs and stumbles to the left then staggers to the right through the front door, into the street, where a truck runs over him and kills him instantly. The bar falls silent. The father moans in grief. The bartender sighs and says, * * * * (Wait for it) * * * * * * (Ya ready?) * * * * (Don't hate me) * * * * ** * * (Take a deep breath) * * * * "He should've quit while he was a head! Comment: Good thing that Norman has such a credible source as A Prairie Home Companion, otherwise we might have to wonder just how such an esteemed Lutheran man found such a joke! Just kidding, Norman! Be sure to visit Norman and say "Umm, thanks." My, but it's been a long time since someone made a drinking-related comment in these parts! Anyhow, a couple years ago, I first discovered the Goose Island Beer Company and waxed poetic about Honker's Ale. I added it (and other G. I. offerings) to the Aardvark's Big Rotation O' Brew and Wine. This year, a different brew finally made it to my rather primitive parts of planet Lutheran and I'm happy to tell you that I took the liberty of sampling Goose Island Christmas Ale on behalf of all our loyal reader(s?). According to the tag hanging from one of the bottles, "with each year the recipe changes slightly so there is something special to look forward to each season. Traditionally, it is a complex brown ale that develops well in the bottle for up to five years. (Emphasis theirs)"
Not wanting to blindly accept someone else's word about such an important topic, I bit the bullet, bought the six, and pledged myself to unbiased sampling. After tallying the results (and the final empty bottle), I must say that this year's brew lives up to its reputation. The one thing I can't fathom is anyone keeping this delicious ale away from his palate "for up to five years." My only regret is not having tasted the ales of previous years in order to make a good comparison. DV, that shall not be a problem again. There is a micro-brewery here in Manitoba which brews pretty decent beer. My question has to do with three of the beers they produce: The Father, The Son, and the Holy Spirit. Would it be considered blasphemous to drink such beer? The Lutherans are not the only folks struggling with church growth and the temptation to jettison liturgy and doctrine for the sake of attracting more people. Can You Dig a New Carnival? Random Dan and Intolerant Elle's marital merger hosts its first carnival since their nuptials. Please visit Lutheran Carnival IL: The Day after Cinco de Mayo at Random Intolerance. Due to a questionable comment, you must now be registered to comment on Purpose Driven Drinking. If it persists, I'll be forced to do comment moderation. My plate is very full (whose isn't?) and I will attend to the broken link pictures as soon as I can. Lutheran Carnival XLVIII is up and running at Living Sermons. Posts this week traveled to Japan before being put together four your reading pleasure and theological edification. Thanks to the chaplain for a job well done and thanks to all who dropped by the Alley over the past fortnight to check out Carny 47. Can I give the Aardvark one of his own Aardie's? I highlighted an older post, Beer in the Bible, from Ask the Pastor this week on my blog, Katie's Beer. The post was noticed by a website called Hop Talk. Be sure to visit and say hello! Lent is over, the unbridled celebration of our Lord's resurrection has begun. I can pour an Eiswein* and enjoy the fruits of my labor in hosting the XLVIIth edition of the Lutheran Carnival of Blogs at Aardvark Alley. *Review to follow upon completion of my field research. St. Louis Brewers Heritage Festival, May 10 - 12, Lindell Pavillion, Forest Park. Celebrating the pre-prohibition era of brewing in St. Louis, this festival brings together big and small brewers from the St. Louis area. These brewers include: Schlafly Beer, Allandale Brewery, Augusta Brewery, Square One Brewery, Trailhead Brewery, Anheuser-Busch, O¹Fallon Brewery, and Morgan Street Brewery. Also featuring 50 different local styles of beer, St. Louis brewing history exhibits, food from local restaurants, and live music. There are four sessions. Thursday is the VIP session and tickets cost $100. The the tickets for the sessions on Friday and Saturday cost $25. See you in Forest Park! Thanks to seminarist Jay Winters, who presents Lutheran Carnival XLVI: Lutherade. Here you can not only read some of the best recent Lutheran blogging but also find out more about Gatorade inventor and Lutheran layman Robert Cade. Also, this is your first threat warning reminder that the XLVIIth edition of the Lutheran Carnival of Blogs will be at Aardvark Alley. I know that many Lutheran bloggers, especially pastors, will be really busy over the next couple weeks. However, Holy Week and the celebration of our Lord's resurrection should also provide ample opportunity and incentive for some insightful writing. Please be ready to submit your own work or suggest that of other confessional Lutherans, according the the general submission guidelines. Again, note that I encourage 3rd party submissions of good posts from those whose humility (or absent-mindedness) precludes self-submission. Since I'm hopelessly addicted to homebrewing now, I've started a new blog to keep everyone updated. I'll cross post good ones to PDD if you'd like. Stop on by this Kantor's Brewery anytime. We'll always have a fresh pint on tap! 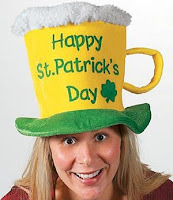 or "Kiss Me, I'm Christian"
What better place than here at PDD to remind folks that the real St. Patrick wouldn't at all be pleased with the riotous living and drunkenness that too often marks his feast day. The United States, especially, stands guilty of commemorating one of Christianity's great missionaries with excessive alcohol consumption and generally stupid behavior. So if you're going to hoist a pint or two in honor of Padraig, try to keep in mind your vocation and the example you give to those around you. And if you'd like to find out a bit more about the saint, please see the commemoration of Saint Patrick at Aardvark Alley. Alcohol served to minors is prohibited. 'tis good to be Lutheran my friends! These days in North Carolina, real moonshine is going commercial, too. A transplanted New Yorker has started distilling a legal — and nontoxic — version called Catdaddy, to answer the growing demand for ‘shine among southern yuppies. And even the old-fashioned untaxed kind is being flavored with peaches to ease the burn. Or so they say. On this, the 2 year anniversary of PDD, I'll give some updates on the homebrew situation here. I'm glad that one is permitted to drink beer in Lent without violating fast "rules", so I'm planning on doing just that. Tomorrow I'll bottle my first two all-grain beers: my "fell in the snow" IPA, and an amber ale I'm gonna call "Covenant Elite: Amber Ale". (wort, wort, wort!). I'm nervous that my IPA is infected, because it has a scent that seems sour to me. The amber smells a bit off as well, but I think it may be ok. I'll bottle them both and we'll find out later if they really are infected. 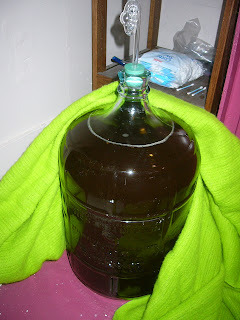 Slow fermenting was the problem I'm sure, since it's so cold in my house (55 downstairs, 60-65 upstairs). I know of a few places where contamination may have occurred (mainly, my wort chiller which leaks a bit of tap water into the wort... gotta tighten the connections up more somehow) and I"ll try to fix those before the next batch. The BVM milkstout is almost ready to taste. I'll crack the first one open on Friday the 23rd (Commemoration of St. Polycarp, Bishop & Martyr). Nunc scripsi totum, pro Christo da mihi potum. Since this blog has been inactive as of late, let me ask a question of everyone who posts here (I will answer it too). What beer do you think is the best value? I don't mean which beer is the best, but which beer do you think delivers quality at a good price. At one time, issues of a wine magazine would hit my desk (the advantage of working at a place with "library" in the name but without any books). In there, they would rate wine on a 0-100 scale. Every once in a while, you would run across a wine which would get above an 80, but be under $10. That is what I want you all to think about. Quality and price. What made me ask that question? I was reading an article about the efficiency of different rifle cartridges. What is my answer? Leinenkugel's. They produce wonderful beers that won't break the bank. It definitely isn't American Macrobrew. Are they the best beers? No, but they are a good value. I can't pay $2-5 for a bottle of beer every time I enter the store. So Leiney's is my every day beer. I'm drinking a Doppelbock right now, and it tastes better, IMHO, than many of the doppelbocks out there that cost more. That, my friends, is value, and Leiney's is a great value brewery. The B.V.M. Stout.... on Candlemas! 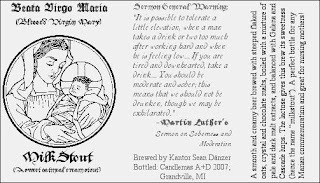 It seems to be something Divine, that without my planning, the Blessed Virign Mary Milkstout will be bottled on Candlemas, a feast of Mary and of Christ (Purification of and Presentation of respectively). Today I bottle, and hopefully I'll get a good number of bottles. Hopefully the beer is as wonderful as I anticipate it will be also. Here's the label I've devised (to be printed on blue paper naturally). I may have to change the notes about how it tastes, but that day comes in two weeks, or perhaps a month. We'll see how it goes. My next beer I think will be an all-grain red ale. Hopefully I'll brew it next week, maybe Wednesday. You know that I do have a taste for the quirky and weird, but the Japanese definitely have me beat. It's a whole country of people constantly trying weird things. – sell it on the cheap to starving Africans? – freeze it for formula in case your country’s birthrate ever creeps back up to 1.0? – design a cutting edge milk-powered Japanese robot? Nope. Obviously, you turn it into beer so that the elderly can get ripped and fight osteoporosis at the same time. Thanks to Necessary Roughness, we discover a way to endure the State of the Union Address and its Democratic rebuttal tonight. We interrupt this hat tip to bring you an essential disclaimer. We publish the following links for entertainment purposes only. Please do not push the game to its obvious extremes. Dangerously high alcohol levels might result. In Prep for the State of the Union, Dan points his readers to The State of the Union Address Drinking Game, a group participation activity based upon words and actions from tonight's speechification. Use with extreme caution — total oblivion may otherwise result. I racked my third beer, the "Blessed Virgin Mary Milkstout", into the secondary fermenter today. The colour is really nice. I tasted some of the un-conditioned and un-carbonated beer, and it tasted very sweet, and had some nice chocolate/burnt flavors as well. Above all, since it's a milk or cream ale, it should be smooth and sweet. Looks like I'm on the right rack so far. I'm gonna let this ale condition in the secondary for a little longer than I had in the past: probably about two weeks. Then I'll bottle it and it will be ready for drinking in another two. I'm not sure what my next beer will be. I have some ingredients for a wheat beer, and I'd like to give another try to my dry-hopped IPA that didn't turn out. I also want to bite the bullet and start brewing from all grain. That involves some more equipment and about 3 hours of time added to my process. Everyone tells me that it's mostly a big mental hurdle, and the actual process isn't all that terribly hard. Plus, in the long run it will be cheaper to brew from all grain, it can make bigger batches, and hey: it gives me the most control over the details of a beer. Eventually, using all grain brewing, one *could* taste any beer and know how to make a similar clone. In beer drinking news, I'm very impressed with the beers from Atwater Brewery of Detroit Michigan. Their "shaman's" porter is great, and last night I had two pints of their "Hell" lager, which was light sweet and thirst-quenching. I had a beer from Ommegang a week ago: their Hennepin Saison. It was refreshing and a little spicy, with great citrusy hops. Their Witte is always a great one. Soft, pale, and refreshing wheat with orange and coriander: one of my favorite wheat beers for sure. Now I'm off to work. I shall report back in when the BVM milkstout is bottled, and when it is tasted! *That would be "Get to Lutheran Carnival 40 (or eXtra Large) — and Do It Quickly!" Yep, Random Dan has poured a full glass of Lutheran cheer and Lutheran Carnival XL is now decanted at the mother blog. Drop by for a deep draught of recently fermented blogging excellence. Also featured is the current "underknown Lutheran," composer Michael Praetorius. I've found his music an excellent accompaniment for consuming quality alcoholic products. Cross-posted (sort of) at Aardvark Alley. Sorry friends. forgot to check the comments! The Stout turned out pretty good. Definetly drinkable, though I'm sure it could be better. My second beer is finished too: a dry-hopped IPA. I don't like it as much... some off flavors, mostly tastes a bit soapy. I think either I didn't clean it very well or perhaps I had it condition at too high a temperature. Still drinkable too, but not as nicely. Chaplain Matt Boarts of LivingSermons presents Lutheran Carnival XXXVIII. IIRC, this is the first Lutheran carny we've had hosted by an active duty military man.